and add one of those cards to your hand. Repeat this process with the remaining 3 cards. Danigral - 5 out of 5. So in case people can’t work out the math immediately, this is a body on the board and 2 cards for 2 cost. The Explorer subtype is icing on the sweet and moist beef cake that is Jeremy(ah). mnBroncos - 5 out of 5. Arguably the top MU deck right now is centered around Explorers and they now got arguably one of the strongest pieces in that deck netting two cards whenever he ENTERS play, not even just when you play him. Obtuse - 5 out of 5. Gives an even more massive card draw advantage to the explorer subtype, enjoying a crazy amount of synergy with Ultima Thule and Roald Ellsworth. Not a lot to say about this card, it’s obviously good for obvious reasons. livingend - 5 out of 5. It appears that Archaeology Interns got supplanted by a way cooler archaeologist wearing a beanie. 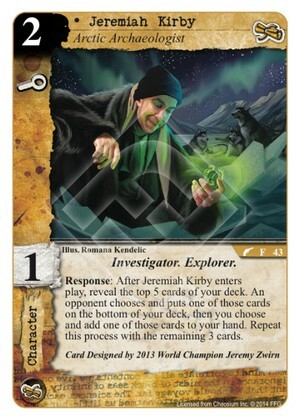 Interesting in that regard, Jeremy won last year’s CoC world championship playing three copies of Archaeology Interns in his deck. What psychological notions can we construe from the similarities between the fictional character’s name Jeremiah and the champion’s name Jeremy? Verdict: Did I mention my dissatisfaction with cards that don’t require verbose analysis? WWDrakey & Ire - 5 out of 5. Was Ultima Thule somehow underperforming, so it needed another boost? Best part here is the Investigator trait, as it helps breathe more life into those Miskatonic/Agency Investigator decks that players are easily drawn to, based on the Core and early cardpool. Just wanting to confirm the way I am reading the ability. I reveal the top 5, you put one on the bottom, I put one in my hand. Then when it says you repeat with the remaining 3 cards, what happens with the final card? Does that card go to the bottom of the deck? Or to the top of the deck? As when you repeat the process, one card goes to bottom, one goes to my hand, and then you end up with a card that has been revealed, and goes back on top of the deck in my interpretation, since the process doesn't say to keep repeating the process, so only interaction for 2 cards were mentioned in the first pass of the process. Bottom. You keep alternating picking cards (repeat this process) until there are none left. It says to repeat it with the remaining 3. I've been using this fellow in a Miskatonic/Twilight deck with three copies of The Doorway (and a few other return-to-hand tricks) and lots of characters with "into play" effects. The number of (relatively controlled) draws he can supply is just sick! He can be quite wonderful. You almost never get your very best cards with him, but always good cards, and him triggering even once can make early resourcing a lot easier. Yeah. That deck also had Alternate Historian 3x for a restricted card, and thanks to Jeremiah she would always have a card or two ready to burn.